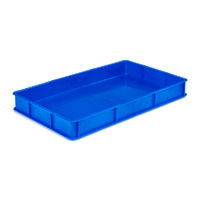 Choose our food-grade stacking trays, boxes, containers and drop-on lids for their durability and versatility. All of our food storage container products are colour-coded for easy identification, food-contact-approved for safety, and manufactured to superior standards. 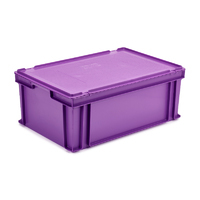 Alongside open-tray containers, our range incudes drop-on lid systems for those seeking airtight food storage boxes. 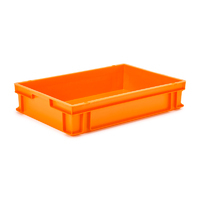 Manufactured from food-grade polypropylene, all Klipspringer stacking food storage boxes, trays and containers are ideal for a diverse range of food preparation and storage environments. Each of our plastic food storage containers also boasts 'inter-stacking' features, meaning that they can be stacked easily and safely. 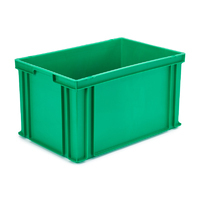 Our range includes both large and small storage containers. Learn more about the dimensions and available colours of our storage containers by clicking on the applicable links below. Order before 4pm for same-day despatch. Food contact approved tray with solid sides and base, widely used in the food industry. 765 x 455 x 90 mm. Interstacking. Manufactured from food grade polypropylene. Available in 5 colours; white, blue, red, yellow, green. Food contact approved box with solid sides and base, widely used in the food industry. 600 x 400 x 120 mm. Interstacking. Manufactured from food grade polypropylene. Available in 8 colours; white, blue, red, yellow, green, orange, purple, and grey. Food contact approved box (600 x400 x 220 mm) with solid sides and base, complete with hand grips for ease of lifting and movement. Widely used in the food industry. Manufactured from food grade polypropylene. Interstacking. Available in 8 colours. 65 litre food contact approved container with solid sides and base, complete with side hand grips for ease of lifting and movement. 600 x 400 x 325 mm. Widely used in the food industry. Manufactured from food grade polypropylene. Interstacking. Available in 5 colours; blue, red, yellow, green and grey. Food contact approved drop-on lid. 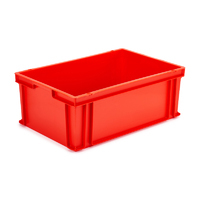 To fit Storage Trays, Boxes and Containers with external dimensions of 600 x 400 mm. 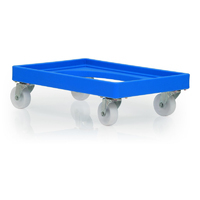 Dolly to fit PM111 stacking tray. Dolly to fit PM200/201/202 stacking trays.